Mauriac syndrome, first described in 1930, is typically diagnosed in young patients with poorly controlled type 1 diabetes mellitus and growth retardation, delayed puberty, Cushingoid features, hypercholesterolaemia and hepatomegaly. However, the sole presenting feature of Mauriac syndrome can be hepatic glycogenosis in both adults and children. The mainstay of treatment for hepatic glycogenosis is strict control of glucose levels, with an excellent prognosis with improved glycaemic control. The authors present the case of a 22-year-old female patient with type 1 diabetes mellitus and a history of poor glycaemic control who was admitted with diabetic ketoacidosis (DKA). She complained of episodes of right upper quadrant abdominal pain associated with nausea and vomiting for the last 2 months with worsening in the last 48 hours. Physical examination was remarkable for short stature and tenderness over the hepatic area with a mildly enlarged liver. The patient had elevated liver enzymes and persistent hyperlactacidaemia despite DKA resolution. 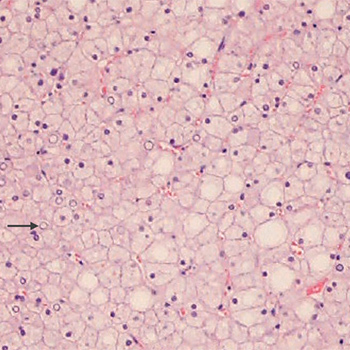 Liver imaging suggested diffuse fat infiltration. The clinical suspicion of hepatic glycogenosis was confirmed by liver biopsy. After glycaemic control was improved, liver enzymes normalized and the episodes of abdominal pain, nausea and vomiting subsided. Giordano S, Martocchia A, Toussan L, et al. Diagnosis of hepatic glycogenosis in poorly controlled type 1 diabetes mellitus.World J Diabetes 2014;5:882–888. Julián MT, Alonso N, Ojanguren I, Pizarro E, Ballestar E, Puig-Domingo M. Hepatic glycogenosis: an underdiagnosed complication of diabetes mellitus? World J Diabetes 2015;6:321–325. Sherigar JM, Castro J, Yin YM, Guss D, Mohanty SR. Glycogenic hepatopathy: a narrative review. World J Hepatol 2018;10:172–185.